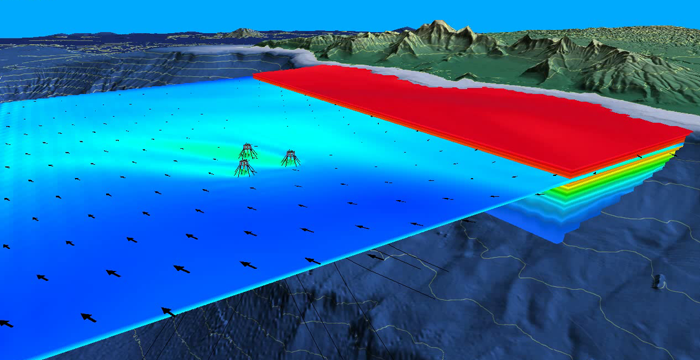 Makai is expanding its environmental and coastal modeling services for clients who discharge into, or withdraw from, the world’s oceans, lakes, and reservoirs. Recently, Makai completed a 3-year effort to adapt the EPA-approved Environmental Fluid Dynamics Code (EFDC) into a robust and flexible dispersion and water quality modeling tool. The new Makai EFDC modeling system (M-EFDC) is specifically designed to simulate and predict the dispersion of large industrial water flows. Combined with Makai’s experienced team, the new M-EFDC enables cost-effective modeling solutions ranging from initial project planning to more rigorous regulatory submittals and watershed management efforts. The adapted M-EFDC model is a state-of-the-art hydrodynamic and water quality model used to simulate aquatic systems in up to three dimensions and time. The modeling results are used in the design, planning, and permitting process for the intake or discharge of a variety of facilities, including desalination, seawater cooling systems including once through cooling systems, LNG processing plants, petroleum refineries, traditional thermoelectric power plants, pulp and paper mills, chemical manufacturing plants, food processing plants, and metal manufacturing plants. The M-EFDC suite can model flows across a wide range of sizes and time-scales. This enables developers to understand the physical, chemical, and biological impacts and decide between design variations in the water system. For example, M-EFDC can help with the site selection for the water intake or discharge pipes, model thermal and chemical plume dispersion, and enable regional nutrient and biological studies. Under DARPA and Department of Energy funding, the M-EFDC model was originally developed to predict the physical, chemical, and biological impacts around offshore Ocean Thermal Energy Conversion (OTEC) plants in Hawaii. The model was adapted to dynamically couple a turbulent plume model with a regional ocean circulation model and predict both near-field mixing and far-field dispersion of discharge flows; a critical enhancement for accurately resolving larger scale discharge flows. The model integrated regional circulation from tides and atmospheric conditions, nutrient cycles, and phytoplankton population dynamics. Results were shown to reproduce the historical 20 year observational dataset collected by the Hawaii Ocean Time Series. View the final report from that study by clicking here and watch a visualization of the physical/chemical plume results using the M-EFDC model here.